The GrooveCenter is used in preparation of the router operation to position the router fence. Contrary to all other set-up procedures, the router fence is positioned and fixed in its position BEFORE chucking in the router bit. Once in position, it should not be moved again. A split fence facilitates subsequent inserting the router bit. 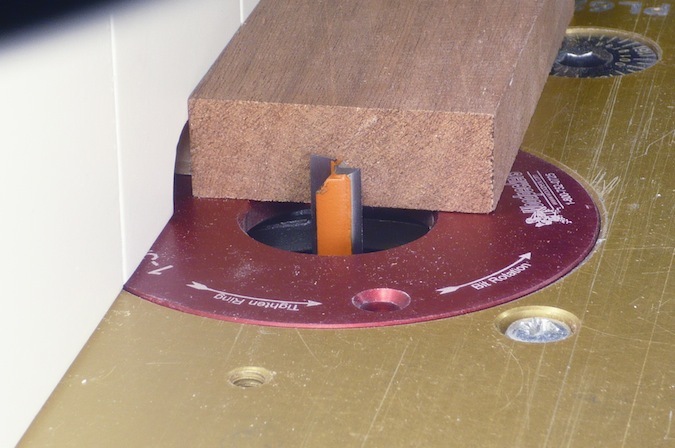 If the fence needs to be moved out of the way for chucking in the router bit, its position can be registered on the table surface with stop blocks. To start, the GrooveCenter’s “Collet Pin” is inserted in the router’s collet. With the workpiece in the GrooveCenter’s Vise, the fence is brought forwards to just touch the Fence Pin and fastened in place. The fence is now in the correct position for making a centered groove or slot. 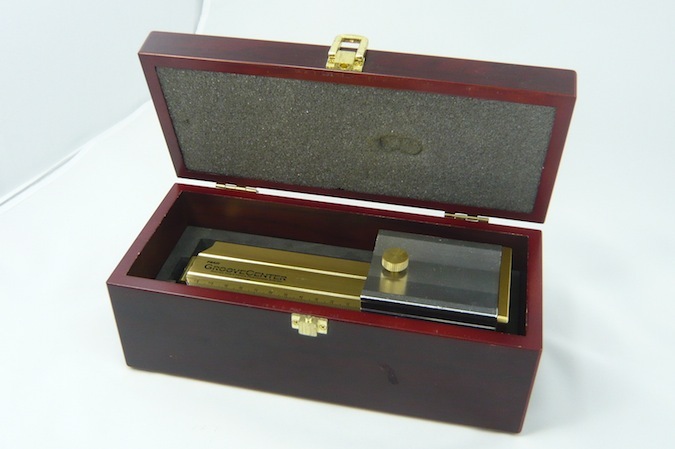 The GrooveCenter can be removed and the Router Bit inserted. In this set-up, the router arbor is equipped with an Xtreme Xtension (www.routertechnologies.com). Look here for more detail. Once the fence has been fixed in its exact location, the GrooveCenter is removed and the router bit inserted. The set-up is complete for the routing operation and a perfectly centered groove is made! This measuring technique is unaffected by the router bit diameter and the result of the measuring operation is always perfect, whatever the board’s width or thickness. 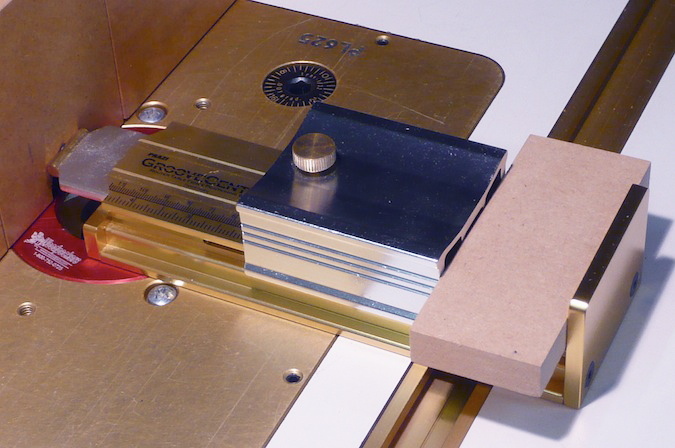 The GrooveCenter is therefore truly a fail-safe set-up tool for the router table. The GrooveCenter accepts boards as wide as 4-1/2”. 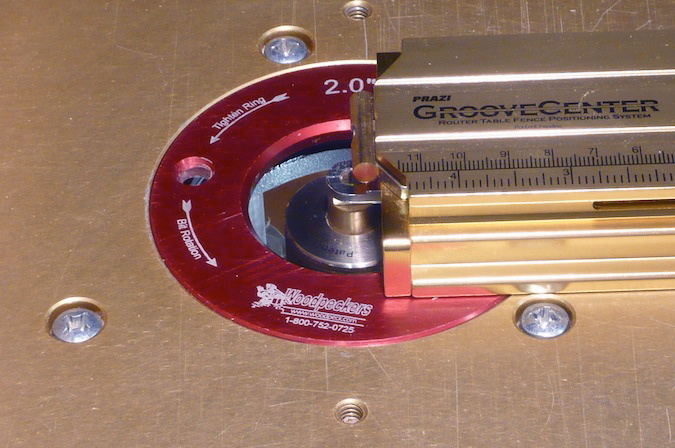 For ease of reference (though not required for a set-up operation), there is a width graduation on the top of the GrooveCenter’s housing, marked in inches as well as metric. Please refer to the detailed “how to” pages for further instruction on successful usage of the GrooveCenter.